It is time for our annual Paulson family reunion in Ocean Park, Washington. 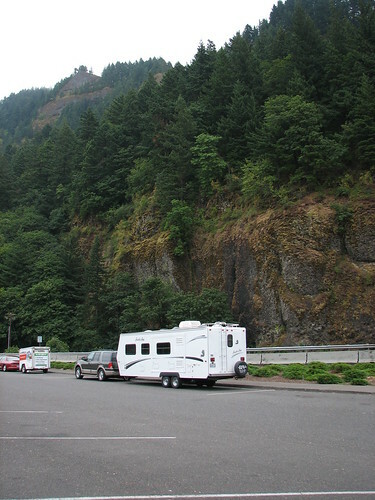 Once again we decide to pack up the travel trailer and head out of town the evening before. Instead of trying to head out early the next morning, we have found it much better to leave the night before — no matter how late. There are always last minute things you remember that delay leaving town. I left work early and got home at 5pm. After packing all my electronics and hooking up the trailer to the Expedition, I thought I was about ready to leave. Then my dear wife asked if I had packed my clothes. Finishing that, I remembered a project that needed to be done but I had postponed, but now could not wait for our return. That project took me at least a 1/2 hour to finish. I had hoped we would get out a little earlier but we were actually on the road at 8pm and did not have to turn around for anything (like we did last week). We drove down the interstate and pulled into Hood River for gas. I expected to pay more for gas here since it was on the interstate and was the only open gas station in town, but it was actually $3.85 per gallon or about 30 cents cheaper than it had been at home just hours earlier. As we got going again on the road the thunderstorm we had been awed by in the distance moved directly over our path and we had a surround-sound laser light show, with lightning bolts visible overhead in the moon roof as well as all around. Then the hail hit and sheets of rain. We finally drove out of the rain and started talking about where to spend the night since it was almost midnight. No reason to pay for a campground. We usually will look for a Wal-Mart or somesuch but I noticed the exit sign for Multnomah Falls. This parking area is interesting as it is actually in the highway median, with interstate traffic zipping by on both sides. We parked in the RV area of the parking lot and I walked around the parking area quickly to see if there were any signs prohibitting overnight parking. Seeing none, we got ready for bed, locked the doors, and fell asleep to the sound of trucks wizzing by at 60mph. We forgot about the train. At about 1 a.m. there was this loud blast from a train horn right outside our window. Seems that since the train crosses the old highway at that point, it must sound its horn — and sound it does. Luckily I was either too tired or it did not go by again till about 6 in the morning. At 8 Brendan, Kyle, and I took the dog for a walk up the trail. We would not have enough time to go to the top of the falls but I would at least get my blood pumping and have a sweat going before 9 am. Back at the trailer we had some breakfast and were headed toward the beach! Yay! That’s awesome! Do you mind specifying where you parked overnight? My family is headed for Multnomah Falls and this is the exact kind of spot we had in mind. Just not sure how to find it! Maybe GPS coordinates?